'Tis the season for lots of food, drinks, decorations and... well, lots of everything! 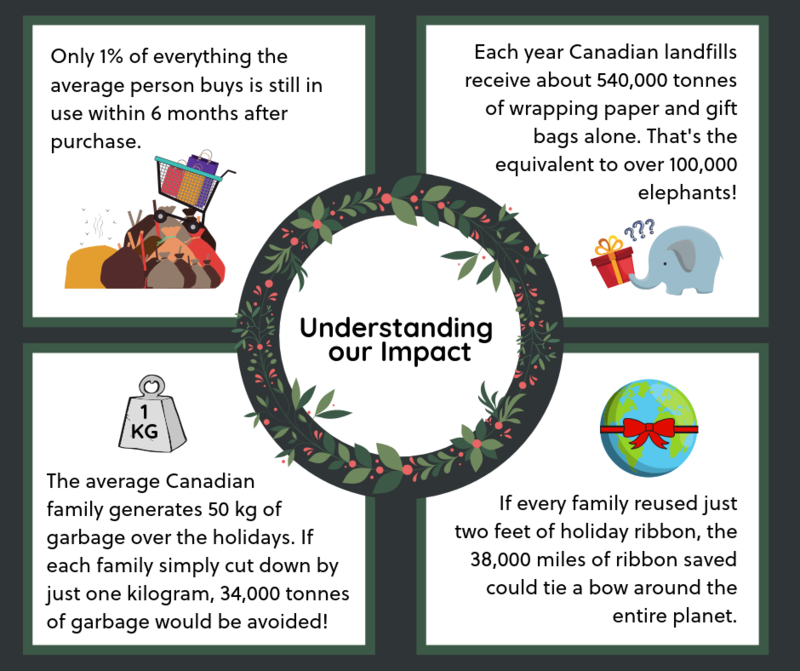 It's a time when overindulgence is hard to avoid, which is why more trash is produced over the holidays than any other time of year. In fact, the average household increases their waste output by 25% or more! Learn what you can do to reduce your impact by following this simple guide. Everything from greeting cards and gift wrapping to properly sorting your waste - we've got you covered! 1. Christmas Cards: Instead of buying traditional Christmas cards, try sending them via email (E-cards), or find a brand that makes theirs out of recycled stock. Avoid cards with an excess of non-recyclable decorative material that will need to be sent to a landfill. 2. Decorations: If you're in the market for new holiday décor, make a local thrift store your first stop, or try making your own out of repurposed or natural materials! If you're feeling creative, there's no shortage of homemade eco-friendly decorations available online to try out, like this! If you have decorations that you no longer use – be sure to donate them! AND - If you want an upgrade from your old Christmas lights, Efficiency Nova Scotia has a seasonal promotion through their no-charge Product Installation Service where you can trade in two strands of incandescent Christmas lights for one strand of LEDs. Sign up here! 3. Christmas Trees: It's a common misconception that artificial trees are better for the environment, when these trees are made from non-renewable plastics and end up in a landfill within an average of 6-7 years. Real trees are renewable and compostable; plus - it's important to support local tree farmers! 4. Have a Plan: Ask your loved ones what they want/ need for Christmas, create a shopping list, and stick to it! Distractions are everywhere this time of year, but if you stay organized you will save yourself money and avoid unnecessary purchases that may seem rushed or ingenuine and are likely to end up in a landfill. 5. Avoid Wasteful Purchases: Instead of buying gifts for the sake of buying gifts, take a more mindful, thoughtful approach. Ask yourself: will this person truly benefit from this gift? Will they use it? Is it a quality product that will last? Are there any sustainable alternatives to this product that is made from recycled material, requires less packaging, or won't contribute to the landfill at the end of its use? Be a smart, responsible consumer! 6. Experience Gifts: This is a great alternative to giving your loved ones "stuff" that quickly accumulates over the holidays. Buy them tickets to a workshop, take them out for dinner or a coffee date, gift them a massage or facial, hire a photographer to take family photos, buy them a gym or yoga studio membership. There are so many fun and meaningful options to choose from! Pro tip: check out upcoming events on Facebook for ideas, all while supporting your local community! 7. Consumable Gifts: This could include gifts like coffee beans bought in bulk, their favourite baked goods (freezer ready so they don't go to waste! ), recipes in a jar, kits to make homemade crafts, or maybe a bottle of wine. Remember, ensure it is something you know they will like and get use of! Go one step further and package these gifts in something that can be reused or recycled, like a mason jar or a nice tin. 8. Re-gifting: Although a taboo idea to some, there should be no shame in re-gifting an item that may be better suited for someone else in your life, if you personally have no use for it. 8. Reuse What You Have: Take stock and see what you already have kicking around the house, from old gift-wrapping materials, to things like silk scarves or newspaper that can be used to wrap gifts. If you're not already in the habit, start saving intact gift wrapping and packaging for future use, including ribbon and bows, gift bags, boxes, and cards! For example, old cards can be turned into beautiful gift tags. 9. Buy Recycled Products: This step is nice and simple - look for items that have been made from recycled material! It's important to support businesses that are promoting a circular economy where resources are kept from entering landfills. 10. Buy Products that can be Recycled: Typical printed wrapping paper is heavily processed and can't be recycled, but it is accepted in the green bin. Foil and plastic wrapping paper, on the other hand, must go to the landfill. Learn about and avoid buying products that can’t be accepted in our green bin or recycling programs. See below for our holiday sorting list! For some great eco-friendly gift wrap alternatives, click here! 11. Have a Plan: If you'll be hosting a holiday get-together, it's important to take stock of what you have, how much you'll need, and what to do with the leftovers. When this is done efficiently, it will save you time & money, and will help spare the earth’s precious resources. 12. Be Resourceful: Save your scraps for things like making vegetable broth, helping a local farmer feed hungry livestock, or search for yummy recipes to make out of your leftovers. When these aren't an option, make sure you're composting all your food waste! Check out this site for all your food-related tips! View our Christmas Sorting Guide (pdf) here!